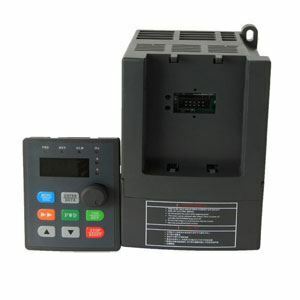 Affordable 1hp VFD, single phase 208V - 240V AC input, three phase output variable frequency AC drive, 220V 4.7amps, manufacturer direct sale. 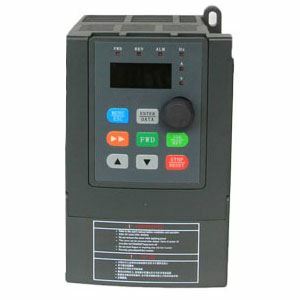 1hp variable frequency drive, single phase to three phase VFD, 220V AC. When you use a Variable Frequency Drive (VFD), you need not worry about initial inrush, as its starting current will be only 100% of full load current. But this is not the main criteria for VFD selection. You have to find out the nature of load ie whether it is a constant load torque or variable load torque. Nominal current demand will tell you the size required for the VFD selection but also you need to look at the application requirement for features. Proper torque control considerations, proper protection from the applications environment and harmonics too. Reaching out to a trained rep from a distributor of quality VFDs is best. As those astute applications, there is not enough information. 2) What is the voltage of the motor? 4) Are there any unusual operating conditions? With this information, most VFD manufacturers should begin to address your application. REMEMBER, more info is always better that too little. Also you can follow this selection guide. I live in the UK, where the domestic voltage is 240 volts single phase, and industrial voltage is 415 volts 3 phase. I have a 1hp machine (a lathe) that will work on either 230 volts 3 phase, or 415 volts 3 phase. Can I use a single phase 240 volt VFD, set at a fixed 50 Hz output, to act as the 230 volt 3 phase input to the 1 hp lathe? I understand that I would need to sum up the total power usage of the machine and set the VFD output maximum current accordingly. If this was deemed to be ok, I assume I would just need a single push button to enable the drive on initial power up. Any comments will be appreciated. Yes, you can use GoHz single phase 220/230/240V to three phase 220/230/240V VFDs to do so.